Use our travel vouchers to discount your MSC Preziosa cruise! Earn travel vouchers by emailing us writeups and photographs of your cruise experiences. The MSC took delivery of the MSC Preziosa at STX France dockyards on the 14th of March 2013. The Preziosa is the latest addition to the Mediterranean Shipping Company's fleet and the MSC Divina's sister ship, part of the amazing Fantasia Class of ships. Originally designed to ferry Muammar Gaddafi and his family around the world, MSC & STX have worked their magic and turned it into a graceful, floating dream. The Preziosa has a children's water park called Doremi Castle and a waterslide which is the longest on any cruise ship. We are now taking cruise bookings for the 2019/2020 season for the MSC Preziosa. You can check availability by filling in the form below (email cruises@southafrica.to if you're experiencing difficulties). November 2015. This photo was taken from a balcony on the MSC Preziosa. The ship being hit by lightning is the Croisières de France. Nobody was hurt, and there was not much damage to the ship. 1 April 2013. The maiden voyage on the MSC Preziosa from Genoa (passes the MSC Lirica on its way out), to Naples (passes the MSC Melody), Messina, Barcelona and Marseille. Also footage of the vertigo water slide. 23 March 2013 : Flash mob - the MSC Splendida and MSC Opera greet the MSC Preziosa during her christening. 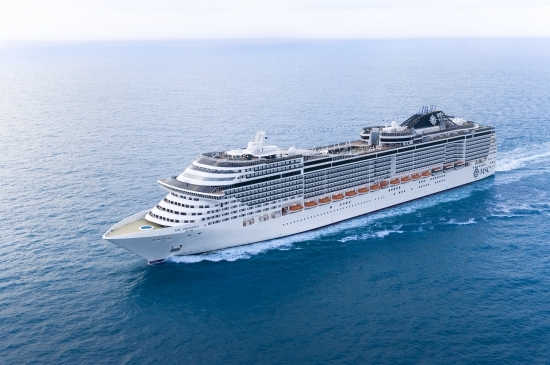 The MSC Preziosa is the latest addition to the MSC fleet. The inaugural cruise took place on the 14th of March 2013. The ship includes the luxurious MSC Yacht club as well as the relaxing MSC Aurea Spa. The Preziosa boasts 3 main restaurants. Inside cabins consist of single beds that can be converted into a double bed (on request), spacious wardrobe, bathroom with shower, interactive TV, telephone, availability of internet connection by laptop(on payment), mini bar and safe and air conditioning. Size is some 16 square metres. Outside cabins consist of single beds that can be converted into a double bed (on request), spacious wardrobe, bathroom with shower, interactive TV, telephone, availability of internet connection by laptop(on payment), mini bar and safe and air conditioning. Size ranges from 17 - 20 square metres. Balcony cabins consist of single beds that can be converted into a double bed (on request), spacious wardrobe, bathroom with shower or tub, interactive TV, telephone, availability of internet connection by laptop(on payment), mini bar and safe and air conditioning. Size is some 22 square metres (including balcony). Aurea Suite with panoramic sealed window consist of single beds that can be converted into a double bed (on request), spacious wardrobe, bathroom with tub, interactive TV, telephone, availability of internet connection by laptop(on payment), mini bar and safe and air conditioning. Size ranges from 22 - 31 square metres. I read that the Gaddafi family got annoyed by the fact that they couldn't just charter a cruise ship whenever they wanted to. Apparently they struggled with the concept of people actually booking and paying for their cruises up to a year in advance. Spontaneity must run thick in their family's veins. Hannibal Gaddafi then decided that they simply must have their own cruise ship and decided to buy one. He called it Phoenicia and told the engineers that the main attraction onboard will be a massive shark tank with 6 sharks inside. Wow. I never realised that dictators cared so much about sharks; then again, they are actually very similar, aren't they. Cold blooded, ruthless...anyway, the plans for their cruise ship came to an abrupt end when their rule was overthrown in June 2011. Hola. If you've read up to here you hopefully know all you need to know about the MSC Preziosa - if not, then pop us a question below or email cruises@southafrica.to (use same email addy to share any cruise photos you take with us - we LOVE receiving them). Ciao.